The barrel Bar Stool is a classic choice for any bar in your home—whether it’s your breakfast bar, in your den or in your basement. The solid wood construction is durable and dependable like all of Amish furniture. 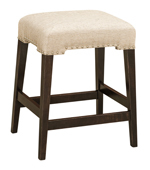 The clean, simple style of these Bar Stools will never go out of style and will fit into any room. Best of all, these Bar Stools have a curved, rounded back so you and your guests can lean back and relax during a party. Seat Height 18", 24" and 30"